Because I didn't have enough artwork going on around here... haa haa haa... I decided to do some art journaling in an old hymnal I had here. I'm not sure what future jrojects may look like but I really was pleased with how this one turned out. I wanted to do a very familiar hymn, but when I turned to it's page it only filled the bottom of the sheet. 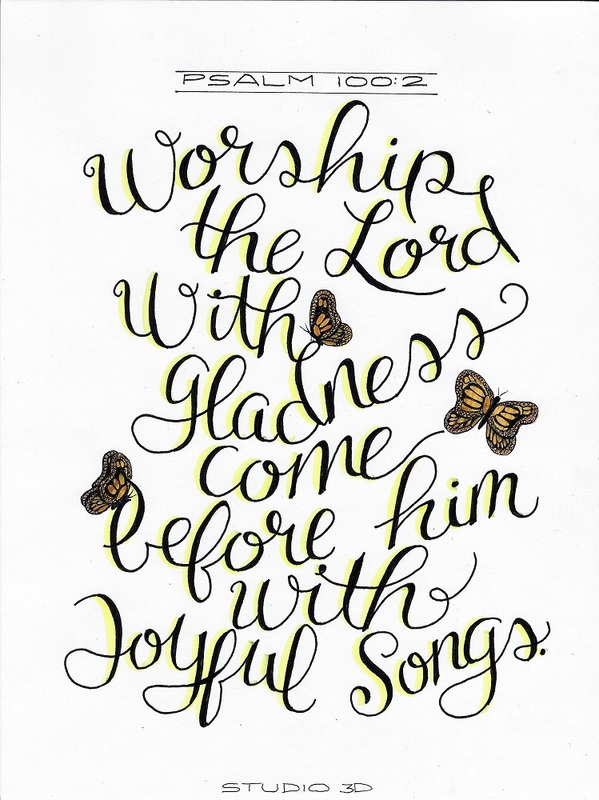 I covered the chorus of the previous song with scrapbook paper and used it to make a new title for the hymn in brush lettering. I used a dry rummer adhesive to hold the paper down. I drew in three flowers with leaves and colored them with markers. Then I added a butterfly to the lettering and a black thick outline around the outside edge of the scrapbook paper. There will be more of this going on! Can you believe it? In just 4 weeks we have learned 7 basic and enhanced lettering styles! This week we will actually learn 3 more. And since it is all done in a progressive manner - one little step at a time - the process is easy and stress-free. This week we are going to make more changes to the basic round print to create three new alphabets. Start by writing the book name ‘Jude’ in the basic round print learned in week 1. On one set, add a single line off to the right side and the bottom of all lines. We are calling this the offset line. On the next set, widen the main downstroke (just on one side) and fill in with dark ink. Then make another set like the second and add simple serifs like we learned in week 3. Just do the single word in all three styles for today. Tomorrow we will begin to see how these look in full alphabets. Here’s alphabet one for the week. 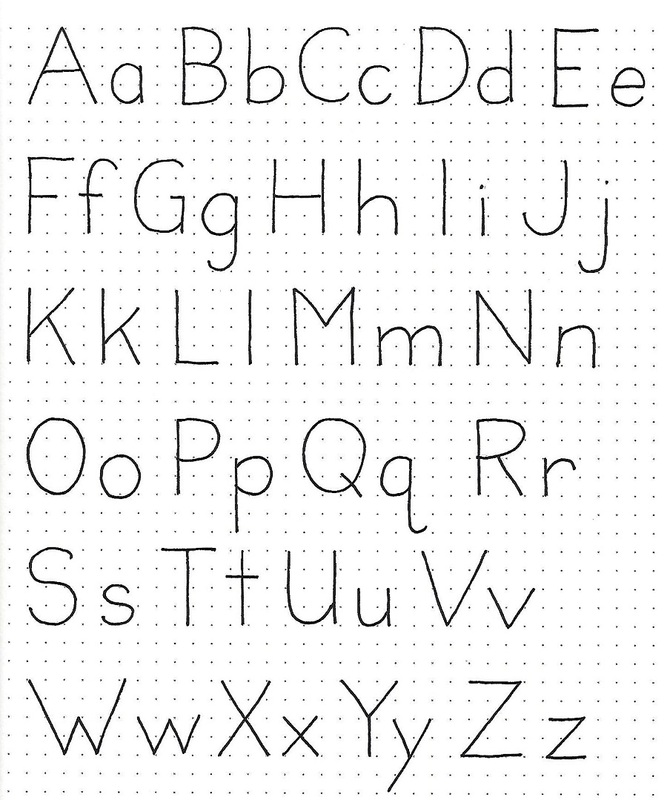 Write out the basic round alphabet we learned in week 1 and then add a single offset line on the right and bottom of all lines. Notice that the ends of the lines to not overlap nor do they touch. Watch for where you can put tiny lines like under the bottom curve of the a, d, u and at the upper left of the m and n.
There will be two alphabets today! First, write up the basic round print from week 1. 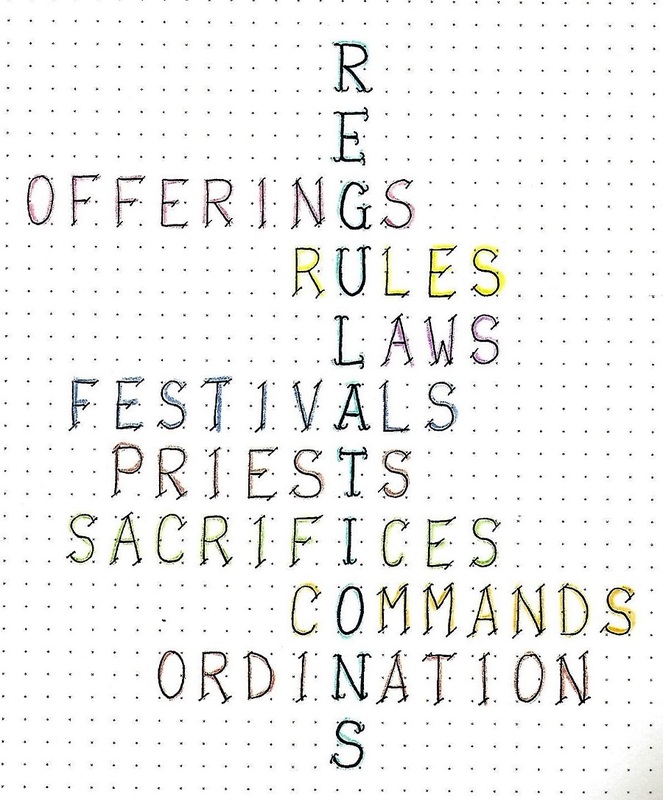 Add a thickened line to one of the verticals on each letter. If that thickened line has a curve, taper so the curve ends up skinny, not wide. Remember, there is only ONE thickened line on each letter. How similar this looks to the previous alphabet, right. Well, it certainly starts out that way. So, draw up the basic round print, thicken one vertical line like we did yesterday and then, add serifs like we learned to do in week 3. See how easy it is to make new lettering styles? Our lettering does not always have to be lined up in neat rows across the page. Are you ready to bust out? We are going to use the three versions of lettering that we learned this week and fit them into shapes. 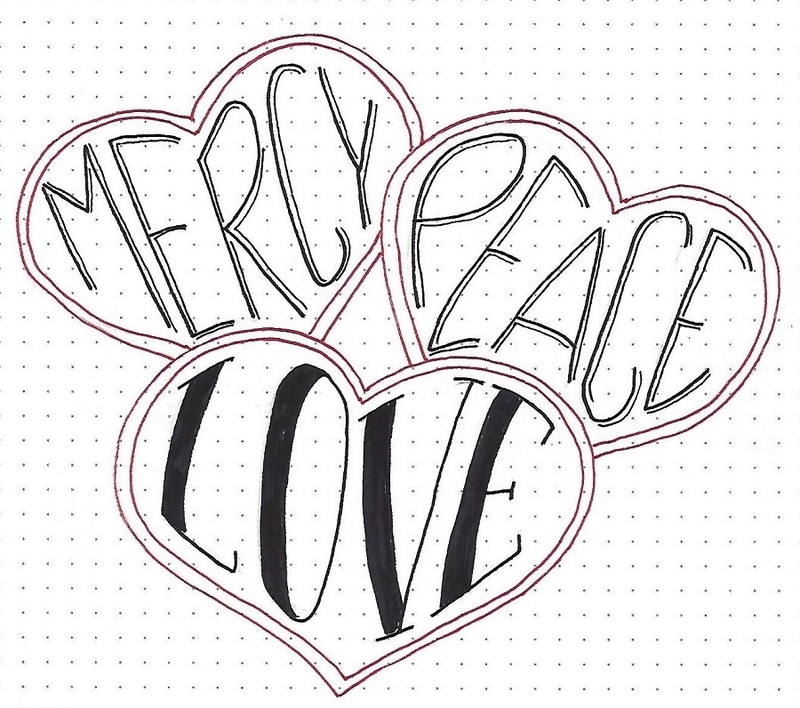 I decided to reference Jude 1:2 – “Mercy, peace and love be yours in abundance.” The natural shape for me was the heart. I drew three hearts in pencil, overlapping them a bit. Then I drew the words in pencil, using the basic round print while stretching and shaping them to echo the outlines of the hearts. Then I inked the letters and, finally, added the variants from this week’s lessons: offset lines, thickened lines and serifs. The last step was to outline the hearts and erase the pencil. Despite the teaser on word shaping yesterday, when I used this week’s lettering in my Bible, I went to the simplest form and lined it right up on the straight sidebar. HA! 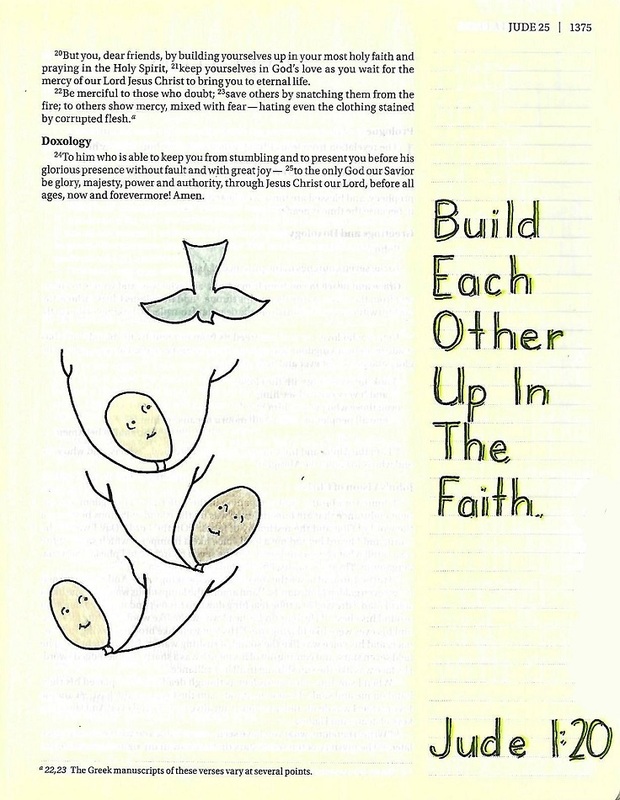 But this seemed to suit the simple message of the scripture which I combined with the dove from the Drawing Room and some stick people, lifting one another up. 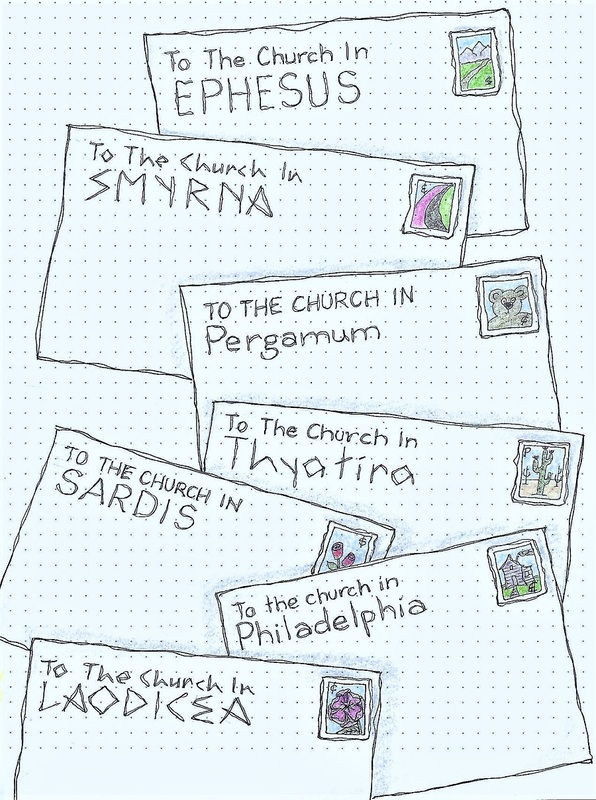 Use any of the alphabets and/or techniques we studied this week to add journaling to your Bible in the book of Jude. In week 1 we learned a basic round print with letter shape options. Week 2 we built on that alphabet by introducing a looser styling. Week 3 saw the introduction of two basic serifs. Now here we are at week 4 and we are going to look at some less conventional serifs. These serifs are used in a more casual manner. We are working through the cover2cover journaling program with CBJ and find ourselves in Leviticus. If there is any book in the Bible that could NOT be described as ‘casual’, this is it! So, I wanted to lighten things up a bit with the lettering – not be so ‘rule’ oriented. The first style begins, again, with the basic round print. But when we get ready to add the serifs, they are a angled stroke and a little longer than the standard short-stroke serif. In keeping with the lighter feel of this style, it is a good one to let the letters vary a bit in size and/or bounce them up off the baseline. Let them play. We’ll continue using the P-I-E method of lettering. If you have forgotten that, please go back and read the introductory materials in the Lettering Unit. 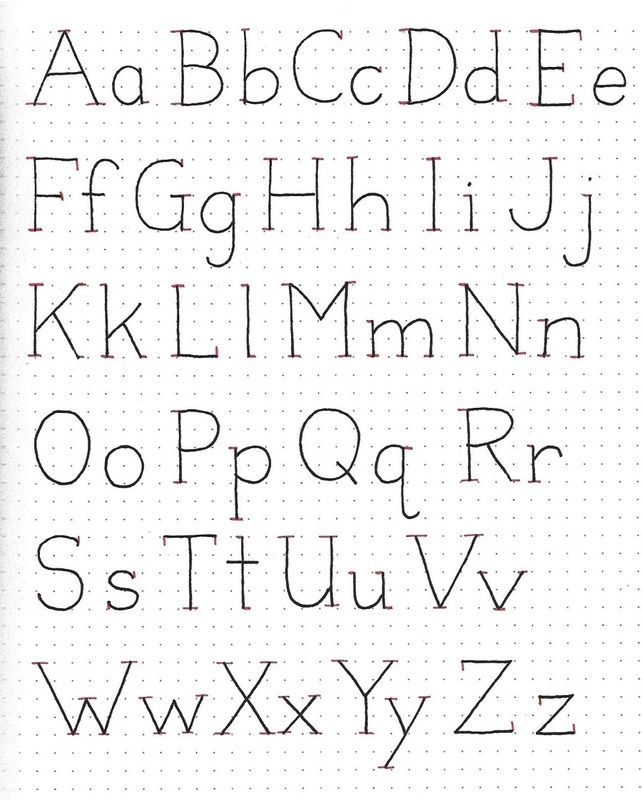 This is the full alphabet for the first casual serif option, based on the basic round print from week one. This casual style is comprised of a single slash in place of the straight short-line serif. You’ll note the informal look of this alphabet. Here’s some good news; the placement of the slashes is entirely your choice! If you think I’ve used too many, just eliminate the ones you don’t care for. Experiment! If you want to go even more informal, try using double slashes in place of the singles. Although we talked about this being a good font to let the letters play a bit, in your reference alphabet sheet, it is best to use standard sizes and keep them sitting in a row. 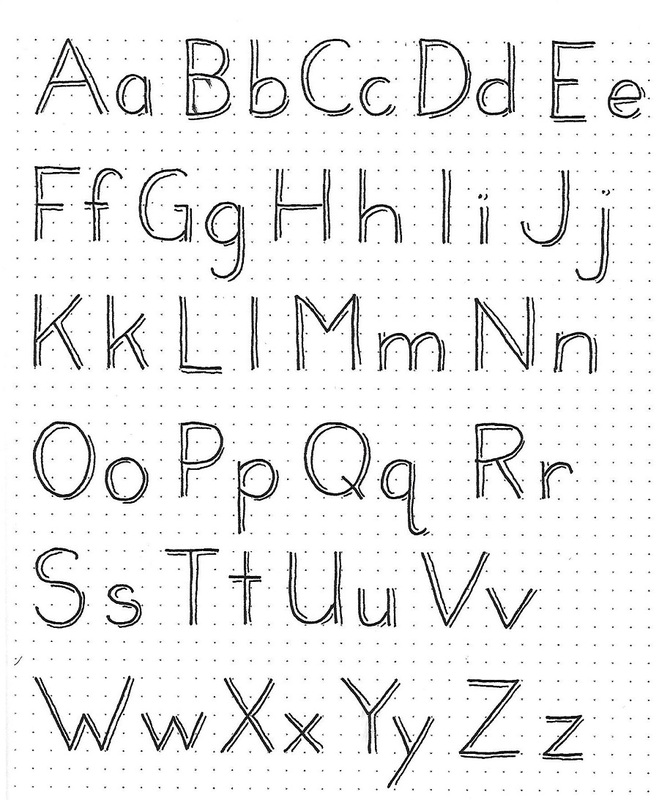 Continue to use the P-I-E method of lettering: Pencil-Ink-Erase. Here is another casual style of adding serifs to your basic round print. These look like little bird wings. You’ll note that there are some places that have only one wing (‘B’, ‘b’, ‘D’, ‘d’, ‘E’, ‘F’, ‘g’, ‘L’, ‘M’, ‘m’, ‘N’, ‘n’, ‘P’, ‘p’… you’ll find the rest. Just start by writing out the basic round print alphabet and then use this reference to place your full or half bird wings. Today I used a crossword-style layout to write up words that cover the main themes of Leviticus. I used the bird-wing serif on the vertical word ‘regulations’ and the slash serif for all the words describing what is being regulated. Find a way to play with your lettering, too. 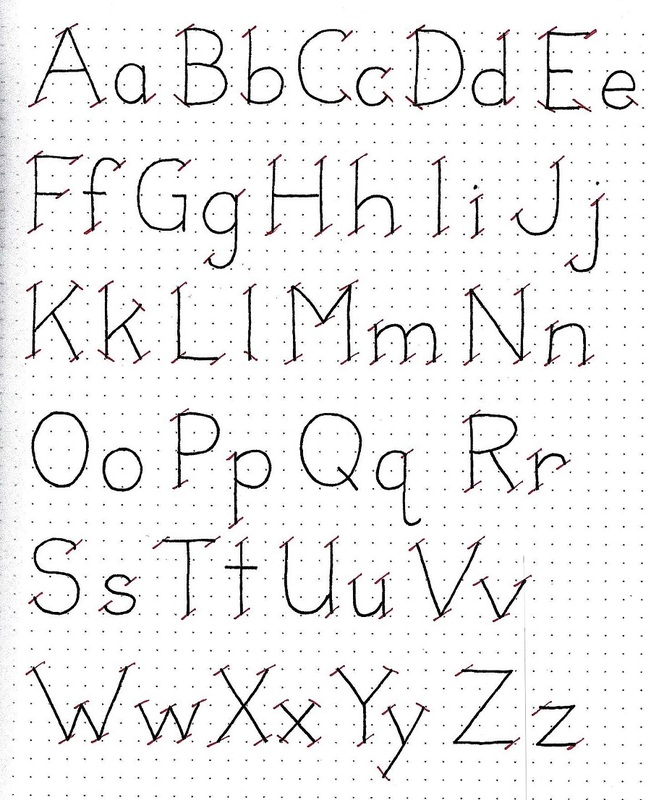 Often, I do sheets like this because they allow me to get a lot of practice with the upper-case. In normal writing, we spend a lot more time on lower-case so this kind of practice is valuable. 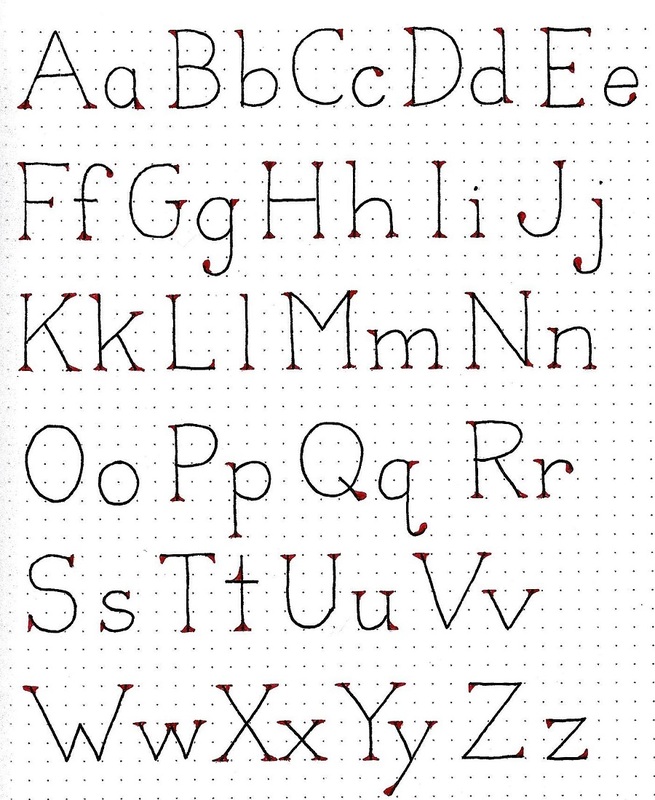 This also help in training yourself to get your letter sizes consistent. I did mine in a single space (unit) wide and two spaces (units) high. In my Bible journaling I tend to gravitate toward commands, prayers and promises. Today is no exception. In the midst of ‘laying down the law’ to the Israelites, God made promises to them on what they could expect if they kept the law (Leviticus 26:12) and if they disobeyed. 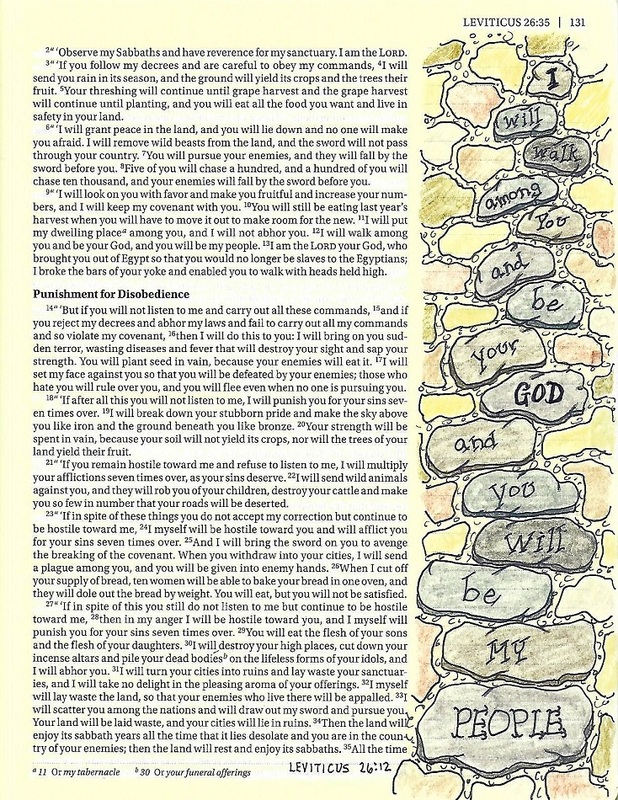 His promise to walk with the obedient is framed on my page with the ‘Stone Footpath’ from the Drawing Room. For most of it I used the slash version of the serif options from this week’s lesson. Just the words ‘GOD’ and ‘PEOPLE’ use the bird-wing style. 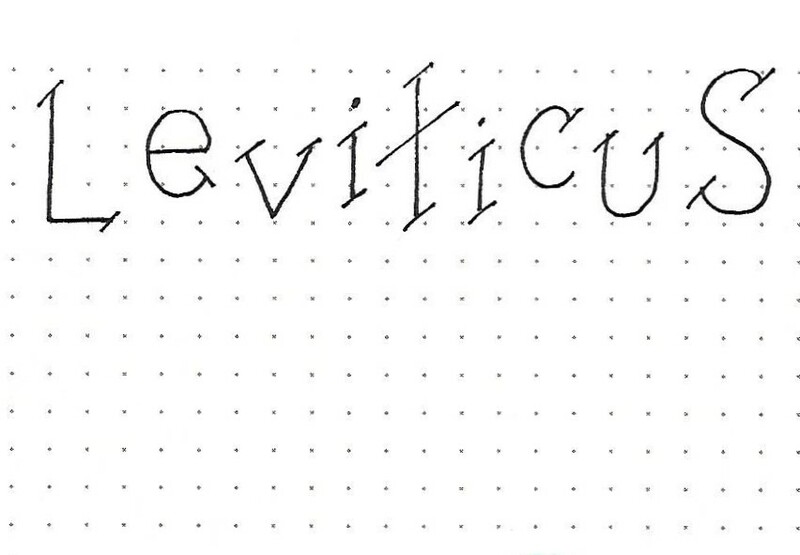 Select a scripture in Leviticus to journal and use one (or both) of the serif option styles for your lettering. 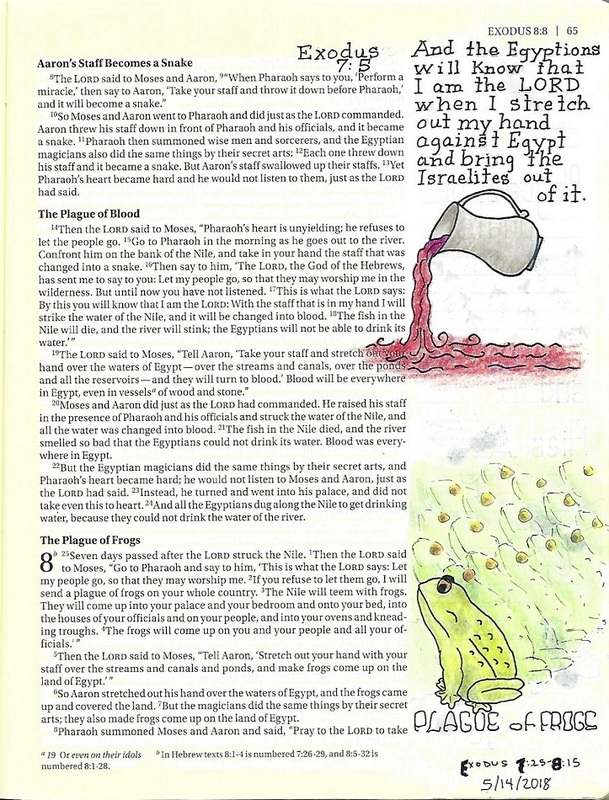 The illustrating of the plagues of Egypt has been a slow process - done piecemeal. I don't think I have showed any of the pages (other than in the lettering lesson yesterday) so I thought I would post them all here together. 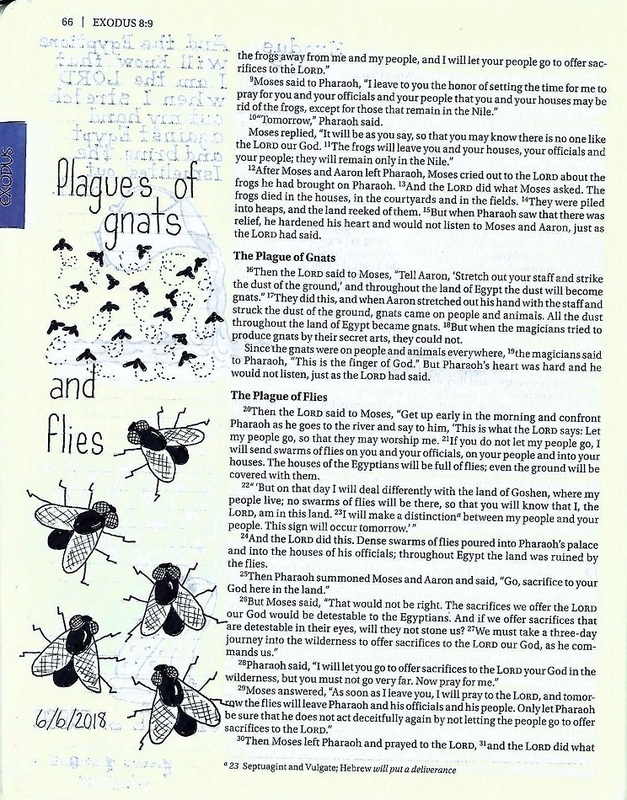 10 plagues in all. The page that follows these celebrates the Passover. The value to learning a basic round print first is that it can now become the jumping-off point for all sorts of fancier lettering styles. This week we will be exploring standard serifs. Serifs are the little caps and feet that appear on print letters. The standard serif is short, goes at the ‘exposed’ end of a letter and can be either a full serif or a half. A full serif sticks out on both sides of a line and a half serif sticks out only on one side. Remember that we follow the P-I-E steps: Pencil the basic letter shapes and add serifs – Ink the letters – Erase the pencil marks when the ink is dry. Type styles, unless they are ‘novelty styles’, are generally described as ‘serif’ or ‘sans-serif’. The term sans-serif means without serifs. So, the basic round font we learned in week 1 is a sans-serif. By simply adding the head and foot marks to the ends of the lines we turn it into a serif style, just like that. Easy-peasy! So, find your alphabet reference sheet from the basic round print and copy it out again. Then refer to the alphabet below to see where the full-width and half-width serifs are to be placed. Remember to follow the P-I-E steps: Pencil the basic letter shapes and add serifs – Ink the letters – Erase the pencil marks when the ink is dry. Serifs come in different ‘flavors’ and today we introduce the triangle, based on the serifs we learned yesterday. You can simply make a copy of yesterday’s alphabet if you wish or you can copy it out again, including the short line serifs on the letters. Then, refer to the alphabet below to see how, making a little angled line to connect your short serif back to the base letter makes a triangle. Note that letters that end in an open curve get a little teardrop instead of a triangle. See the ‘c’, ‘e’, ‘g’, ‘J’, ‘j’, ‘q’, ‘r’, ‘y’. Also, note the single anomaly with the ‘t’ which has a curved triangle at the intersection instead of at the top. These serifs are filled in when you ink. The triangle serif looks better on a letter drawn with a thicker pen. We’re still using the P-I-E steps: Pencil the basic letter shapes and add serifs – Ink the letters – Erase the pencil marks when the ink is dry. We’ll practice both styles of standard serifs today. 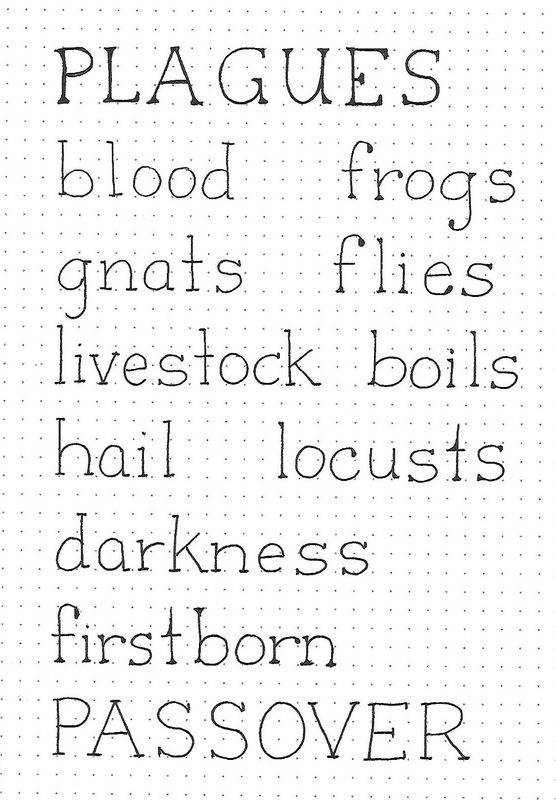 I made mine into a list of the plagues of Egypt. The left column has single line serifs and the right column has triangle serifs. Side by side this way you get a better feel for the ‘flavor’ of each one which can help you decide which to use when you move into a new project. 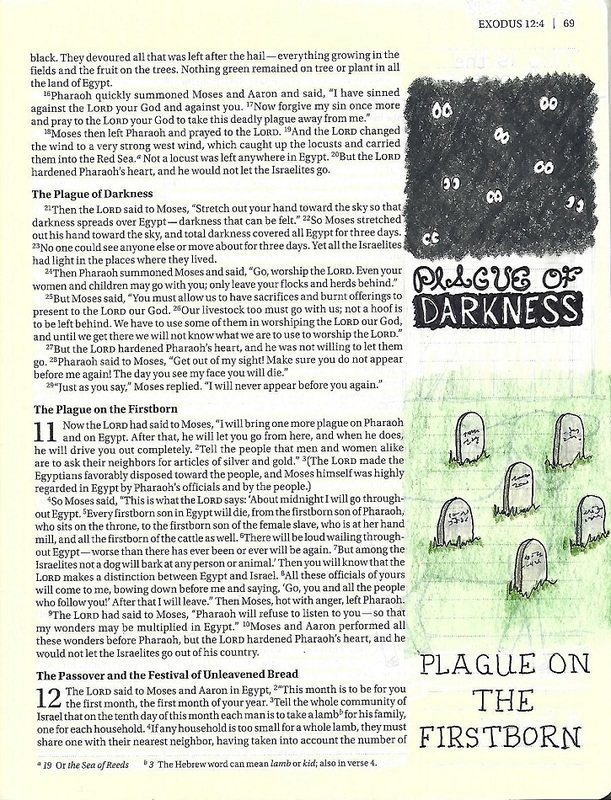 You’ll also note that I made the lines heavier in the word ‘PLAGUES’ to illustrate the difference line weight makes. 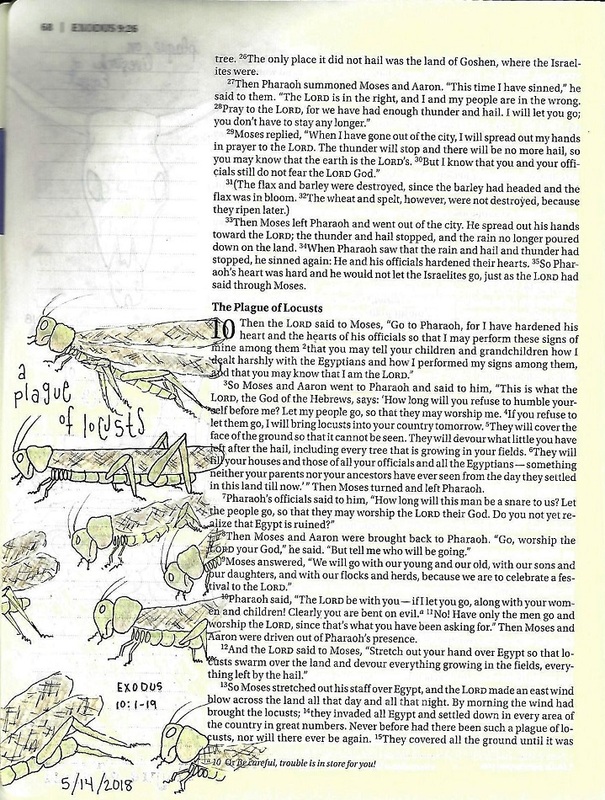 I’ve been gradually illustrating the plagues of Egypt in my journaling Bible.For today’s exercise I used the short-line standard serif style to write the introductory scripture to the account of these disasters. On print this small, the triangle serifs were much too heavy. I made the numbers in the scripture reference match the serif style by adding little marks to the ends of the digits! 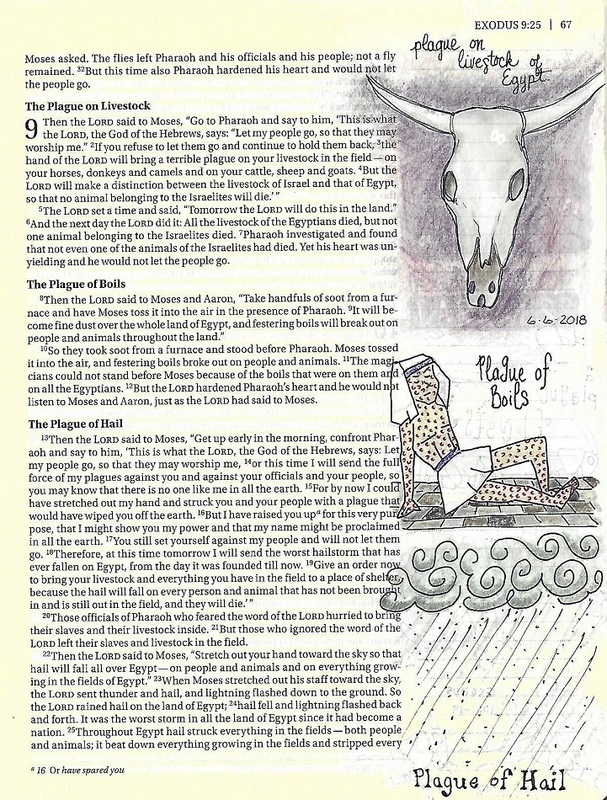 Using the P-I-E steps, Pencil the basic letter shapes and add serifs – Ink the letters – Erase the pencil marks when the ink is dry, add a scripture to your Bible in the book of Exodus. And so ends week 3. So many times, students say that they don’t do lettering work because their hands are so shaky. Well, this is just the lesson that will take away all that fear of wiggly lines. Because we are going to MAKE the lines waver all over the place and then trace over them again to make sure they wiggle some more. 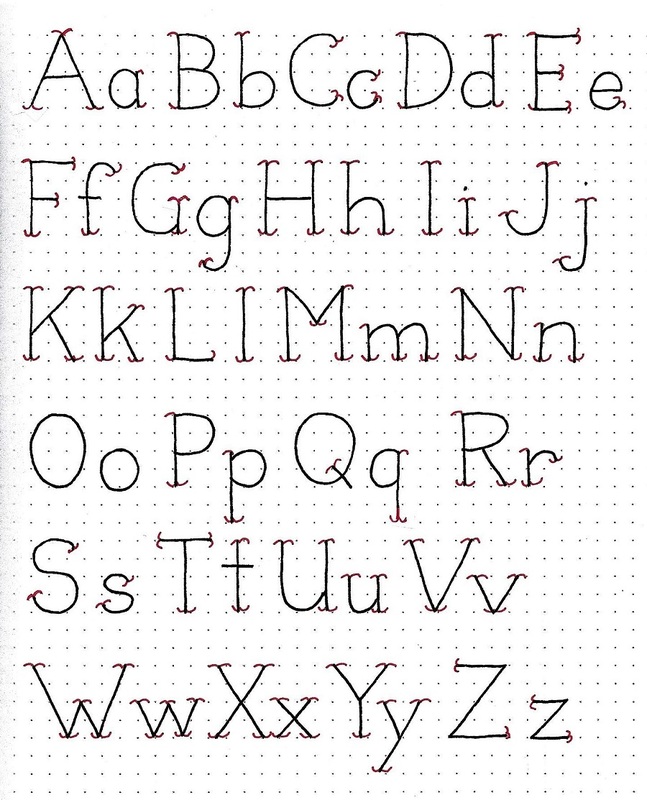 First, decide on the scale you want for your letters and pencil in a guide for the top of the caps, the x-height, the letter base and the descender. Then lightly pencil in your basic letter shape. When you take up the pen, I want you to draw wavery lines over your pencil (no matter how straight the pencil is). Then go back and make a second line, letting it touch or cross as you wish, trying to use the second line to counteract any bumps in the first line to make the cohesive whole look straighter. So, if you have a line with a big warp in it on the first pass, make the second pass travel on the inside of the bump to visually pull it back into line. Sounds strange, but it works! Try not to leave the ‘exposed’ ends of the lines with two loose ends. I usually start where the lines are connected, wavy-draw out to the end and wavy-draw back in, without lifting the pen. 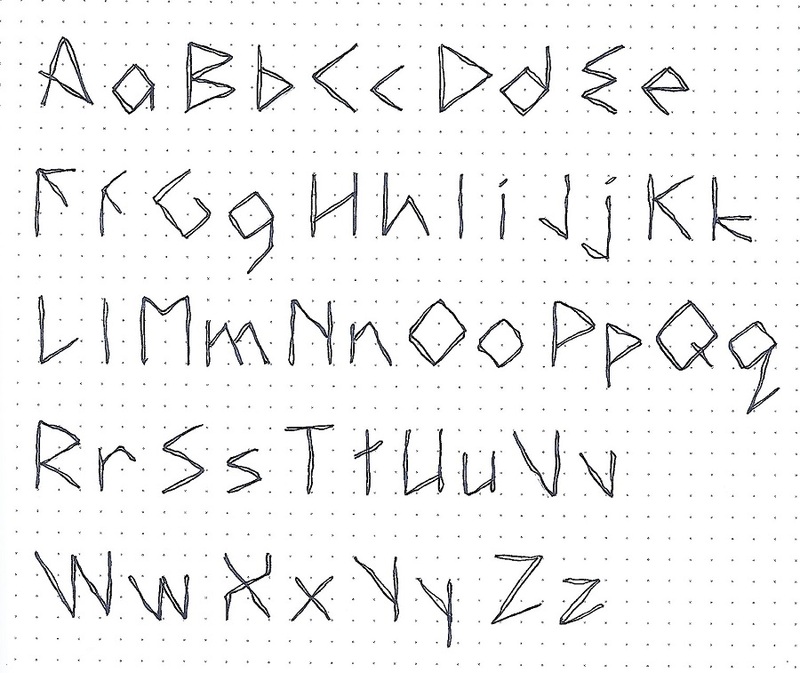 You can use any of the alphabet forms already presented in this series as your base letters. After getting a taste of this style yesterday, you could probably have figured out today’s whole alphabet pretty easily. 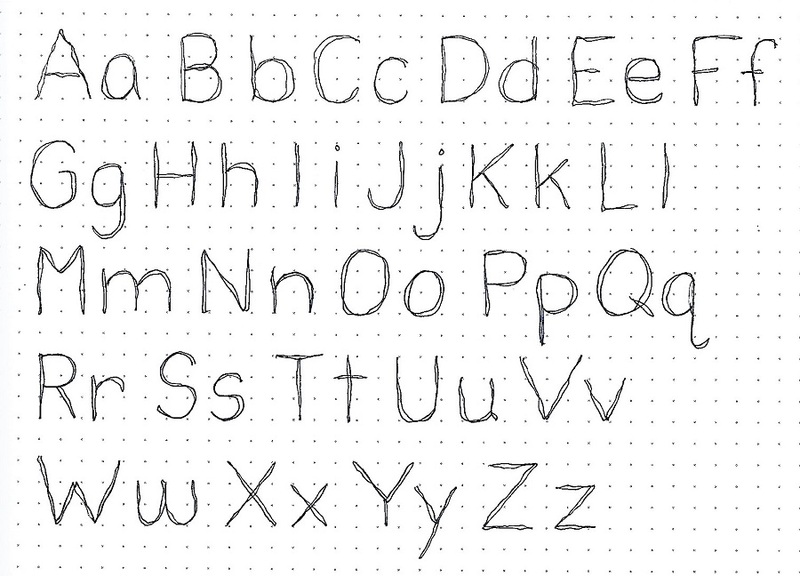 In fact, you can use this method on your alphabet of alternative letters from last week if you want more practice. Don’t forget to draw your base forms lightly in pencil first and add the wiggle as you ink them. Remember, we discussed yesterday the easy way to enclose those exposed ends of lines: start where the lines are connected, wavy-draw out to the end and wavy-draw back in, without lifting the pen. We get a bonus alphabet this week – same technique but on a different letter form. Our previous letter forms have all been using a print with very round ‘bowls’. You will notice that this new alphabet has NO rounded lines. Everything is straight lines and angles. By combining this angular print with the ‘relaxed hand’ style it creates an antique-looking font – great for biblical writing! Same as before, draw your guidelines to set yourself up for consistency in letter size, lightly pencil the letter forms, ink with wavery lines, erase the pencil. Using wavy lines to outline the envelopes and the stamps gives a cohesive feel to this page in my workbook. The ultimate goal of these lessons is to provide you with a growing lettering vocabulary to use in your Bible journaling. For my page, I went to Revelation 22:17 and paraphrased part B. I used the Angular Alphabet with the wavery lines in my text. I used the Drawing Room lesson for the week as my illustration. An online group I belong to started out the year with a couple of challenges and a swap and I was inspired to participate. The first was a swap where the supplies were limited to black and white. I love this combination! I chose, for a background, a dry-embossed music image on white cardstock. To this I added some white stickers mounted on black cardstock and cut out. I used a black rub-on frame to highlight a clear text sticker. Then the whole thing was mounted on a black cardstock card base. I broke the rules just a bit by adding a line of glitter gold gel pen around the edge and in two little hearts inside the heart stickers. This is a 4.25 x 5.5 card. The second card was for one of the challenges. 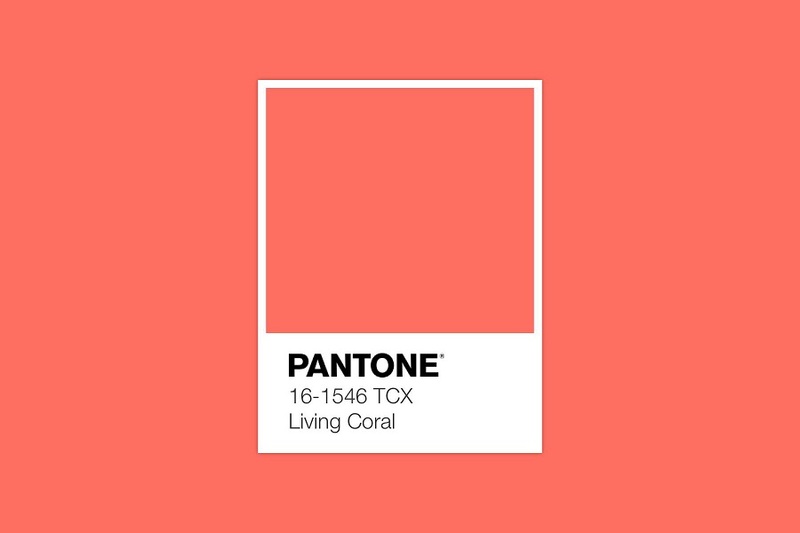 Its guideline was to feature the Pantone Color of the Year (Living Coral). This is a favorite color of mine! I rummaged through the scrap bin on top of my work surface and instantly had a handful of bits and bobs left over from other projects. I made a card base 6.5 x 4.5 and arranged all the pieces on it. I took a phone photo and ran all the parts through the Xyron to apply adhesive to them. Using my photo as a guide I did a peel and stick to reassemble my design. As a last step I added a clear text sticker and then used black pen to make doodle lines around the elements to unify them. Success! Two cards in one seating. 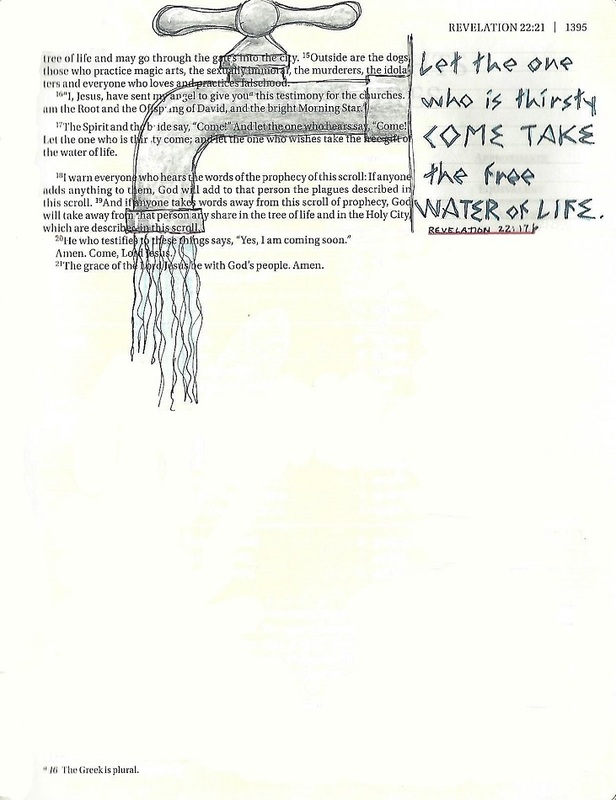 On the Bible journaling group I belong to I started a new series on lettering. I begins with Genesis and then skips back and forthe between the old and new testaments. The lettering itself, however is constructed in such a way as to build one skill upon another to move from a basic round print all the way through bounced brush lettering - one small step at a time. This week we will be learning a basic round print style. For this first exercise, note that the ‘bowls’ of the letters are very round and straight upright. After practicing with the standard print, try changing it up a little by mixing the capitals with the lower-case, making some lower-case letters exceed their standard ½ height or bouncing letters off the base line. It is best to do only one change at a time so the integrity of the base style is not lost. 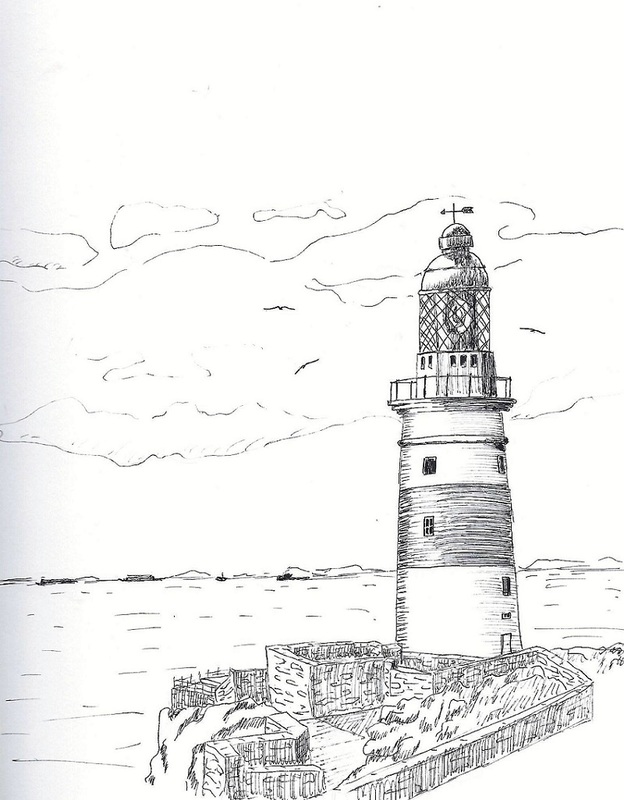 All week long, we will sketch out the letters and words lightly in pencil, correct until they are exactly as you want them, trace over the pencil with pen and then, when the ink is dry, erase the pencil. This is the full alphabet for the basic round print style. Note that the ‘bowls’ of the letters are very round and straight upright. The x-height is ½ the full letter height. Sketch out the letters lightly in pencil, correct until they are exactly as you want them, trace over the pencil with pen and then, when the ink is dry, erase the pencil. This sheet introduces some options for lower-case letter styles and sizes. The changes to note are those marked in red pen. Any of these can be incorporated into this style to make it feel more like your own. We are still keeping the bowls round and the letters fully upright. 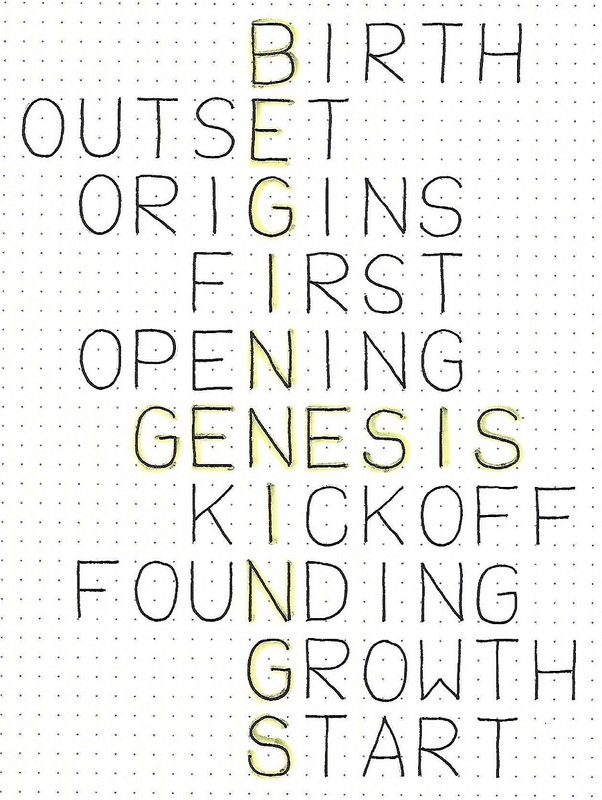 A thesaurus yielded up synonyms for the word ‘beginning’ and they were incorporated into a sort of crossword in celebration of the book of Genesis as well as the beginning of a new year and a new plan for the Lettering Lodge lessons. The two key words were then drawn over with highlighter. For your piece, sketch out the letters lightly in pencil, correct until they are exactly as you want them, trace over the pencil with pen and then, when the ink is dry, erase the pencil and apply highlighter. 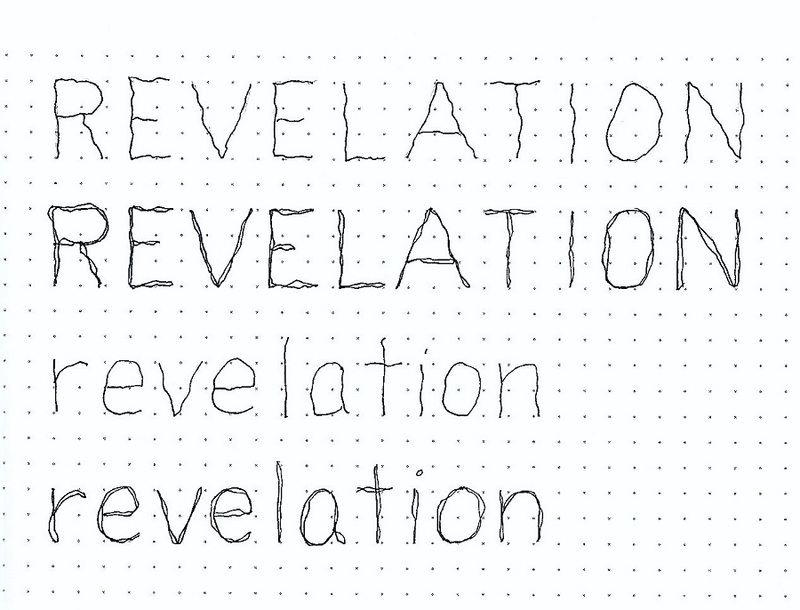 The culmination of the lesson plan, every week, is to use the lettering style in the Bible. Use any of the options that were presented this week to write out a scripture from Genesis. For your page, sketch out the letters lightly in pencil, correct until they are exactly as you want them, trace over the pencil with pen and then, when the ink is dry, erase the pencil. Illustrate the scripture as you wish. 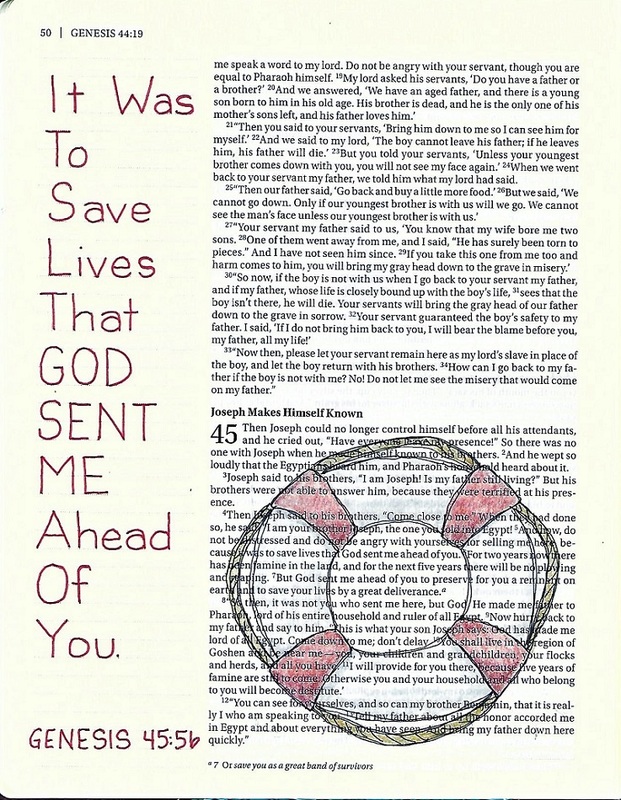 This page uses the Drawing Room Lesson (Life Preserver) from this week with Genesis 45:5b. This year I did a lot of trying out new things as well as renewing old skills. Most of my creative energies were spent on quilting, drawing, making drawing tutorials, lettering, making lettering tutorials, Bible journaling and watercolor painting. Other pursuits included lots of travel, taking online classes and reading. In reviewing my activities, I chose my top 10 favorite results. In July, I completed a watercolor painted card front every day of the month. I chose three favorites. In Bible journaling I was especially pleased with two. Overall, it was a very successful year. It was hard to choose so few as favotires as I really didn't have any real 'stinkers'. I hope you stick around to see what's shaking in 2019. I plan to keep creating! This week, in light of the arrest and detainment of Christians in China, I felt compelled to create a font that focuses on COURAGE and CHAINS. This is the lesson plan that I used this week. The first line shown is the basic letter set and then bars are added to connect them to create a chain of letters out of that word. This font is ONLY an upper-case and all of the letters are exactly the same size, with the same spacing between letters. Your ‘box’ for creating each letter will be 3 units wide and 2 units high. Each corner is rounded to form that letter into a ‘link’ in the chain. There will be a 2-unit space between the letters. Draw out all the letters in your word in pencil, then ink it and erase the pencil. The connecting links will be 3 units long, the same as the letters. They can be placed in random positions, just as long as they link the letters. That’s why every letter has those rounded corners, so there will always be some place to link to. Have a great time learning this new font. Today is the reveal for the entire COURAGE alphabet. As I pointed out yesterday, every letter is the same size (2x3) and features rounded corners and extensions to use for linking. Spacing is always 2 units so the 3-unit links will extend ½ unit into the letters on each side. I am loving the look of the J, Q, R and V especially in this font. Note that the D has one sharp corner as, if that corner is rounded, you end up with another O! When you write out your sample alphabet you can skip the linking lines as this will be your reference page for future use and the links will move about depending on the words you are writing. Sometime in the future, you may decide to use these letters in a more traditional manner: No links and a tighter spacing (1 unit, instead of 2). 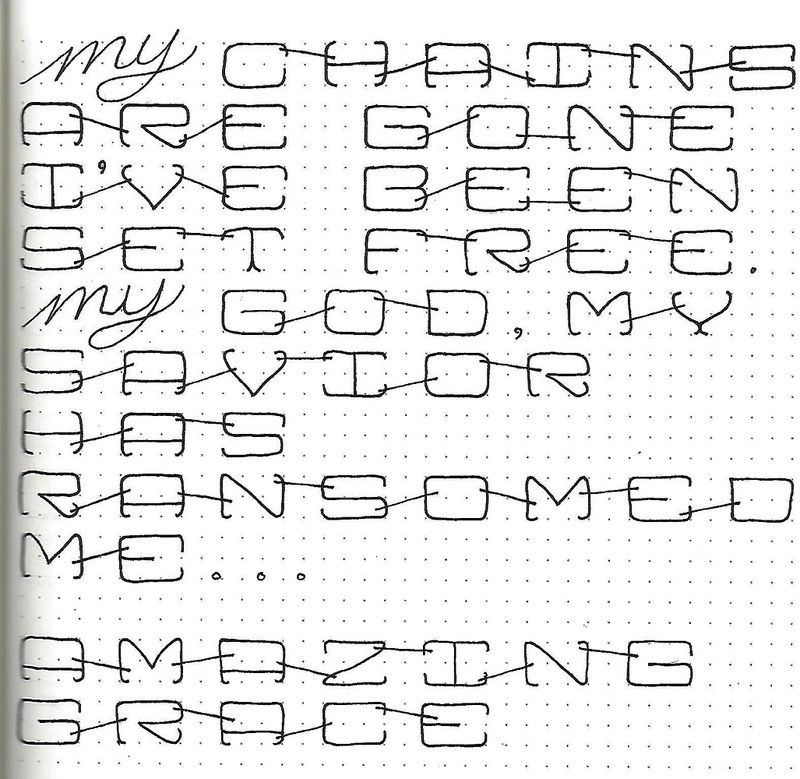 Now we are going to practice with the new font by writing up song lyrics that have to do with COURAGE or being in CHAINS. I am dedicating this font to calling attention to the recent arrest and detention of Christians in China. I hope you will join me in prayer for these brothers and sisters in Christ. My paper did not have enough space to write all the words side-by-side so I changed one word to a script and thereby reduced its footprint. Join in by writing your own song lyrics, or a quote or other phrase. Today is more practice with the COURAGE font by writing a scripture on practice paper. My piece, again, focuses on CHAINS. I added the words ‘the Lord’ because the scripture starts with the word ‘he’ and I wanted to be clear who it was talking about. How are you liking this font? When I got ready to write this scripture in my Bible, I realized that the focus word was actually too long to use the font. We adapt! I used a space-saving script and then used it again down the page, to create continuity. You’ll note that the letters are shrunken down from the practice letters but remain perfectly readable. 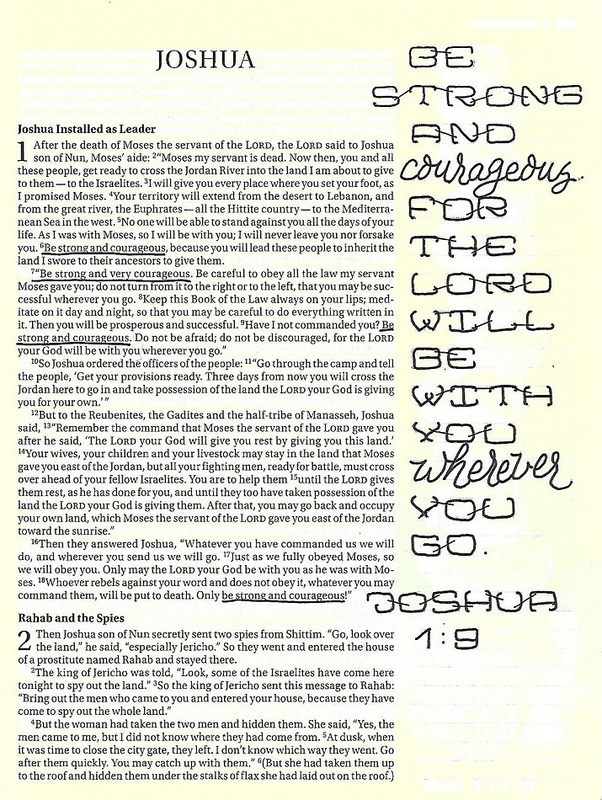 As I scanned this first chapter of Joshua, I found that FOUR TIMES, the Lord told him to ‘Be strong and courageous’. WOW! I guess there is a lesson here in what God expects of us. Select a scripture that talks about COURAGE or CHAINS and journal it in your Bible using this font. 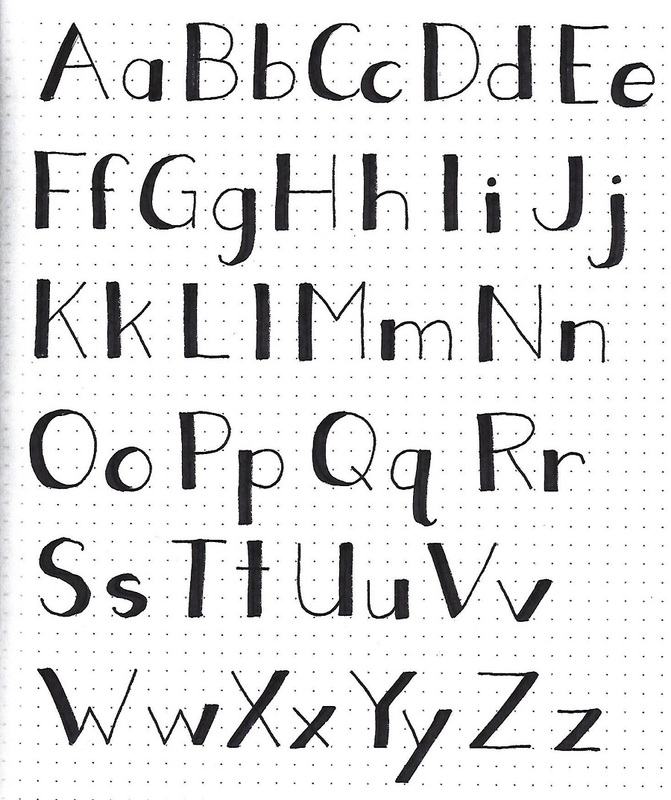 If you ever 'play along' and use these font I teach, I would love to hear about it! The font I taught this week is (the capitals) one I designed at least a dozen years ago just for fun. I searched to find a lower-case that matched with it and then did a few changes to make it my own.